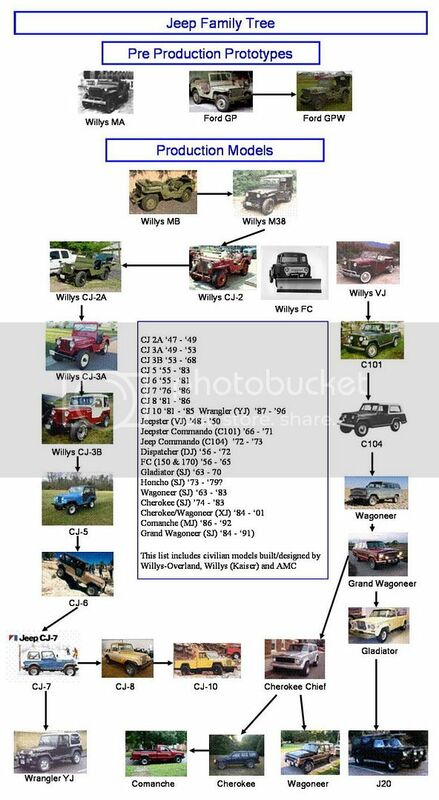 Here is the Jeep Family Tree I did up. It seems some models might be missing. When done I will host it as pdf file to compliment our AMC Eagle Family Tree --- since they are related. Very cool. Nice job. Now we just have to check to see if we are missing anything. Should we include the Jeep side of things? from 83 Eagle: Should I go ahead and try to trace the Jeep models? If I have time?? from route 66 rambler: I would say go ahead and do it. If it doesn't get used by myself or Iowa Eagle, then maybe a Jeep site would be able to, or if you want to start a Jeep place, I was planning on offering some of my available sub-domains as free pages to members here and elsewhere for AMC-related sites. 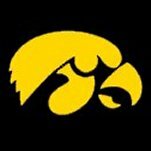 form IowaEagle: That would be great. There are a lot of Jeep models to research and I am wondering for a family tree for them if you don't need to do back to the Bantam days or even way back to the Quad 4 days. from IowaEagle: Its a good starting point -- although I think AMC carried over the basic line after purchase. Refinement came later, although, I think, AMC power came almost immediately for several models. I have not gotten them all over here yet, but I will. Have to go mow lawn and other silly things. Did I send you the one with the descriptions as well? It has a few sentences about each vehicle on the Jeep tree. No, just the one with pictures, model names and some arrows and lines. If you, or anyone is interested in seeing the one with the descriptions. I can email it. Just let me know. Thanks. I am glad that it will work for a quick history lesson. I should have a little time on Sunday or Monday to edit it into clickable thumbnails to the larger pictures... right now, because of the file sizes of the pics, it takes a little while to load, but I'll see what I can do with it after Saturday is over. Great job, Brandon. I am wondering since later Cherokee's 1984? and beyond were uni-bodied should they be a distinct new model line? I would say no since the body lines are allmost identical to the older one. Thank you for formatting that to be able to be posted. I did not want all the work that I put into it to go to waste because the computer I used did not have a way to format the document to be posted. I have one with all of the descriptions of the different models that I can email to anyone who might be interested. I stopped this Jeep Tree with the last three AMC Models... Cherokee, J20 and Wrangler. I am sure we could expand it to today if there is an interest. Model info might be interesting. Go ahead and send it to me. Did you see any mistakes? Will let a few others chime in and then I will start work on a pdf version which will allow for better pictures and text. It did not take long to do it after I got the pictures saved. It was a pretty straight forward progression of models. The Wrangler was actually derived from the CJ-7 not the CJ-8. The CJ-8 was a spinoff of the CJ-7, because it was a pickup version as was the CJ-10. Also the Wagoneer and Comanche were all based on the 1984 Cherokee, so they should all be on the same level. The last four models from AMC were the Cherokee, Wagoneer, Grand Wagoneer, Wrangler and the J20. I guess I did not make that clear enough in my tree that I sent you. Sorry. I will send Iowa Eagle the Tree with Descriptions when I get back from U-Pull-It. I wonder where the FC's and postal Jeeps fit into this? And the 3/4 ton military trucks made by AMC Jeep? And, of course the Humvee. I know it was AMG but it used Jeep and some Eagle technology and the final AMC prototype was finished off by Roy Lunn who was asked to come out of retirement to fix the issues the Army had with it. I did a little looking and it appears the FC Jeep may be a line of its own. It was designed shortly after Kaiser bought Willys Overland and started the new Willys company to produce Jeeps. And, it appears the postal vehicles were, at least, originally FC's. There were a lot of variations of this unique Jeep, despite fairly low production numbers, here is a website with a ton of pictures showing different uses http://www.newcotech.com/fcjeep/ . While researching I did find a reference to thoughts of making the FC into a 4WD passenger van -- way back in the mid 1950's! Apparently only a clay model was made. I renewed the image in the first post. I spotted at least one goof in the time line where the Wrangler year text is next to the CJ10 info. Will fix before I do a pdf.